If you love to hunt, fish, and eat wild game, this could be the perfect cookbook for you! Babe and Kris Winkelman, husband and wife, worked together to create this masterpiece of a cookbook. 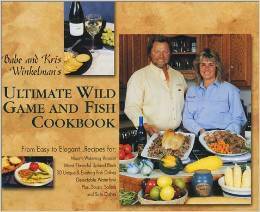 Babe's television shows, Good Fishing and Outdoor Secrets, were made even more popular by his wife's feature segment “Kris's Kitchen.” After receiving many requests from viewers for them to create a game and fish cookbook, they decided to give it a go. Kris states that the goal of their cookbook is “to find a happy middle ground between the complicated recipes utilizing hard-to-find ingredients used by professional chefs and the smother-it-in-cream-of-mushroom-soup recipes most of us grew up with.” This cookbook is very detailed in how to prepare wild game so that you can create savory, restaurant-quality meals. Say goodbye to fish that tastes to “fishy” or venison that is much too tough! Chapters in this cookbook include Taking Stock, Cooking Basics, Big Game Recipes, Upland Game Bird Recipes, Fish Recipes, Waterfowl Recipes, Starters and Side Dishes as well as Sauces and Marinades. Altogether there are 130 recipes! As I glanced through the cookbook, the first recipe I saw was “Fall Off the Bone Venison Pot Roast.” Now doesn't that peak your curiosity and make your mouth water just a little? !